Create a better bond and your anti-slip tapes and treads will grip tighter and last longer. Anti-Slip Surface Primer works by chemically altering the substrate surface, increasing the surface energy and making it more receptive to adhesive bonding. You need no specialist equipment to apply it, it’s fast acting and easy to use. 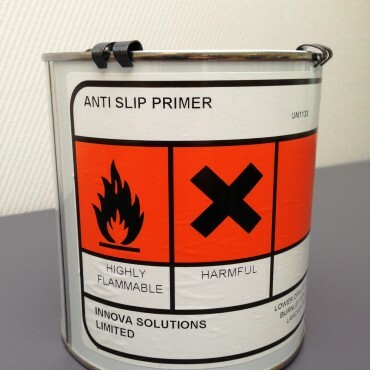 Anti-Slip Surface Primer is also ideal for fixing rigid laminated plastics such as Formica, Warerite and Melamine. * Ensure the backing of the supported PVC leather cloth is of sufficient quality to prevent the primer soaking and spreading. Remove dirt, dust, excessive grease, oils or other contaminants from the surfaces to be bonded. Open primer and stir before use. Apply a thin coat of Anti-Slip Surface Primer to both surfaces using a brush or spreader. 2. Allow the solvent to ‘flash off’ (evaporate). On absorbent materials (eg leather/chipboard) this may take 2-3 minutes. On non-absorbent surfaces (eg metal) allow a minimum of 15 minutes before bonding. Bond materials applying firm pressure. Please note: The above guidance does not constitute a Material Safety Data Sheet (MSDS). For handling, storage, composition and safety information please ask us for an MSDS when you order the product. Before using the primer please ensure you have read and fully understood the Anti Slip Surface Primer MSDS. Contact us if you have any questions. Does priming the surface really make a difference?